A New York Gangster... in Norway? 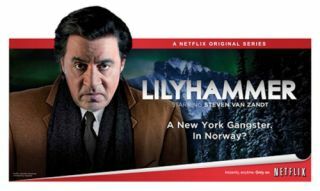 Netflix has announced that its march into original television programming will begin on February 6 with the debut of gangster drama Lilyhammer. The eight-part first season will star Steven Van Zant, who played Silvio Dante in the Sopranos and is a member of Bruce Spingsteen's E Street Band. Van Zant plays Frank "The Fixer" Tagliano as a mobster who gives up his boss to the FBI and moves to Lillehammer in Norway as part of the witness protection programme. All eight episodes of the show will be available to watch instantly on Netflix in the United States, Canada and Latin America. From the look of the trailer it appears that the first of many original shows to become available exclusively through Netflix could be a winner. Sopranos fans, especially, are in for a treat. In March 2011 outbid HBO for the rights to its first original series, House of Cards, a drama series starring Kevin Spacey. The company has yet to announce when it will air. Meanwhile Netflix, looking to recover from a shaky second half of 2011, has revealed that over 2 billion hours of content were streamed via the service in Q4 last year. The company will continue to branch out into new territories with Netflix set to launch in the UK and Ireland in the early part of this year.